Swimwear required. Dress code strictly enforced. VIP cabanas, daybeds, padded lounge chairs, live entertainment, bottle service, dining and cocktail menu. 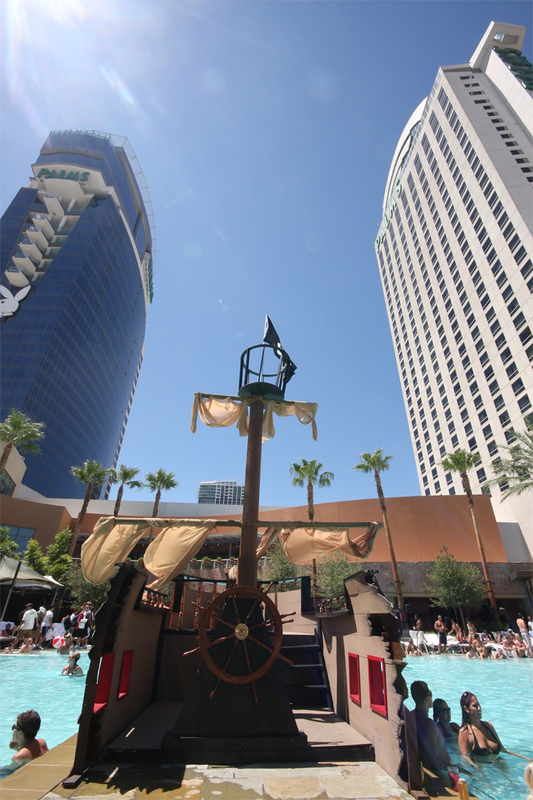 The best Las Vegas pool parties are not limited to the Strip. In fact, party-goers can find one of the most popular pool and day clubs right on Flamingo Road. 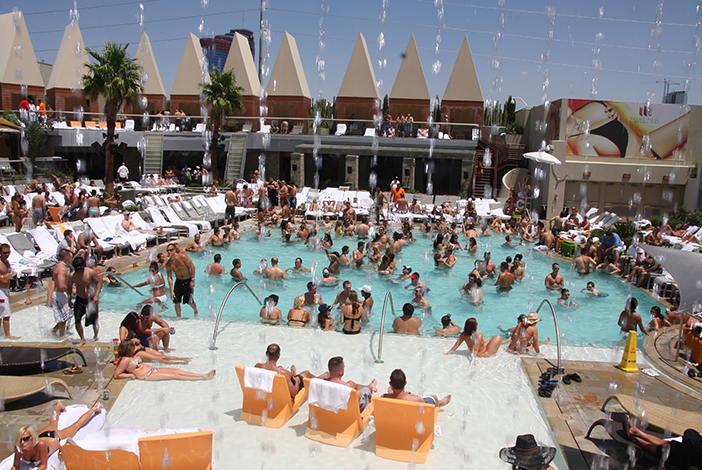 Palms Pool & Dayclub can be found inside one of Vegas’ hottest party destinations, the Palms Resort & Casino. With the ability to accommodate up to 3,000 guests, the more than two acres of pools, bars, and gaming areas are guaranteed to deliver tons of fun and relaxation for patrons 21 years of age or older. 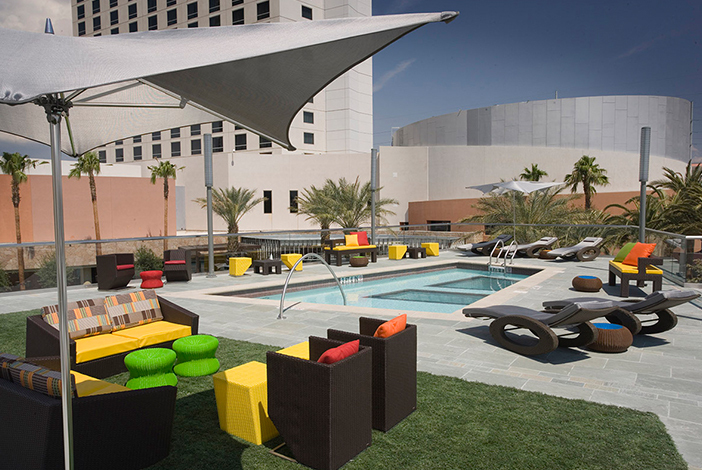 Palms is well-known for their wild pool parties, as well as “Ditch Fridays” where guests are encouraged to skip school or work to enjoy a day of lounging in the sun. The spacious pool area features many of the features you’d expect to see an upscale resort location, such as spacious VIP cabanas, padded lounge chairs, daybeds, bottle service, live entertainment, and a delicious dining and cocktail menu. Hotel guests with a valid key and wristband (provided in-room) also receive complimentary admission before noon on Fridays and Saturdays. Open every day during the summer, you won’t want to miss out on the opportunity to socialize, drink and create memories under the Las Vegas sun. The resident DJs keep the atmosphere upbeat, while the multiple bars spaced throughout the venue ensure that no one goes thirsty. There’s also numerous visually stunning features that will catch your eye, including the 12-foot cascading waterfall located behind the Waterfall Bar. If you prefer daytime clubbing to the nightlife scene, this is the place to be. Celebrating a special occasion, such as a birthday, bachelor party, bachelorette party, or other important event? Consider hosting your celebration at the pool. The poolside cabanas are the perfect place for groups to gather and hangout for the day. Each cabana features state-of-the-art 32” LCD, a house phone, speakers with individual volume control, a lighted fan, a refrigerator, and more. 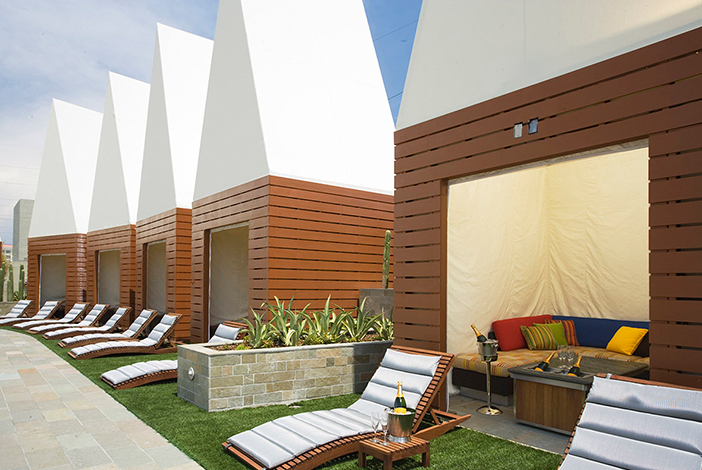 Gather a group of your closet friends for a day in one the venue’s spacious, fully-equipped cabanas. For the ultimate pool party experience, one pool just won’t do. This is why Palms offers several pools for guests to hangout in and around. The first pool is ringed by six cabanas with chic custom interiors. A swallow wading area gives way to the second pool, which sits next to the two-story bungalows. These bungalows are equipped with their own private pools, a doubled-sided fireplace, bedroom, and lawn. To the left of the second pool are canvas cabanas bordered by a concert stage. Between the two pools is a glass bar, along with six blackjack tables that sit beneath the glass-bottomed third pool. Two waterfalls feed the swallow wading areas. Within all the chaos are three bars, including The Glass Bar, The Waterfall Bar, and The Entry Bar. While there’s no doubt that the venue is a great place to drink and socialize, many guests also come to this Las Vegas hotspot for the entertainment value. The Dayclub frequently hosts events, including live DJs, special concerts, and party celebrations. If you need an excuse to skip work, you have one. The Palms pool is the perfect place to spend a day, loosen up, and experience a party scene unlike any other. In addition to an abundance of beautiful ladies, the venue also has never-ending cocktails, upbeat tunes, and plenty of luxurious features to keep you entertained and relaxed. The party picks up quickly as the day goes on, ensuring there’s never a dull moment. 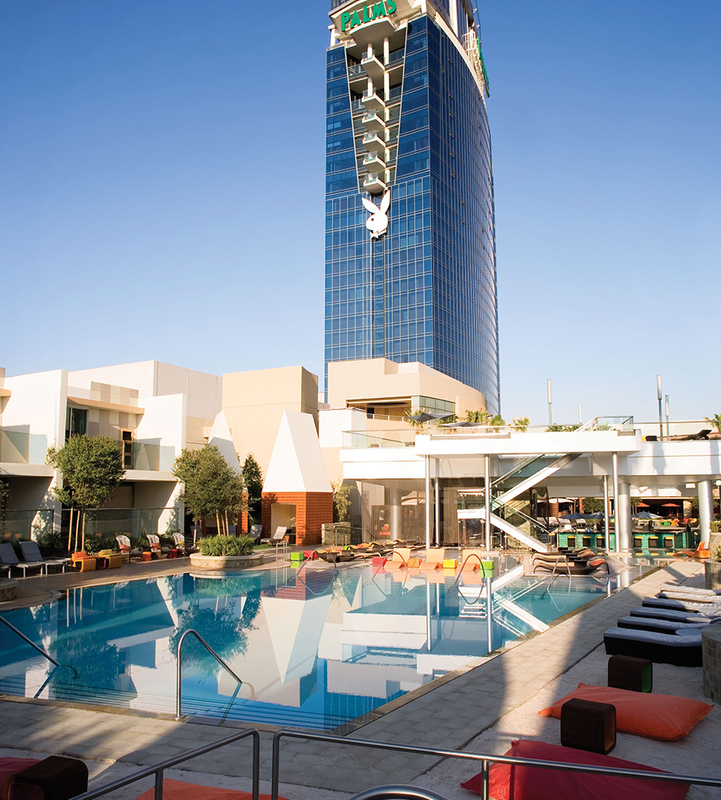 If you’re in the mood to relax, make your way to Las Vegas to the Palms Pool and Dayclub.